Rediff.com » Movies » PIX: Bollywood Gals SIZZLE New York Style! PIX: Bollywood Gals SIZZLE New York Style! New York is the new Switzerland in Hindi films. With more and more films being set/shot in the world's greatest city, Bollywood's leading ladies have taken to New York fashion with much aplomb. Starting with Kangna Ranaut, who looks refreshing in a printed skirt and black stockings -- a must-have for winters in New York -- in her upcoming release I Love NY opposite Sunny Deol, we take stock of how our leading ladies have done in the fashion department over the years. In her most charming onscreen avatar, Sridevi's housewife from Pune doesn't discard her floral saris for her trip to the Big Apple. Instead, Shashi flaunts her Indian avatar by teaming it with a trench coat. The beautiful Aditi Rao Hydari works her leggings and boots as she stands pretty with the famous Brooklyn Bridge in the background in London Paris New York that released in 2012. Priyanka Chopra coordinates all the must-haves in a New Yorker's closet -- boots, stockings, a plaid skirt and a colourful scarf -- in her 2010 Hindi romance Anjaana Anjaani. Anushka Sharma stands out in her tiny shorts and a canary top as she frolics at a Miami beach in Parmeet Sethi's con caper Badmaash Company. Parts of the film were shot in the Big Apple. In Kabir Khan's 2009 thriller New York, Katrina Kaif plays a college student and compliments her look with tee shirts, floral skirts and knee length boots. Dressed predominantly in voluminous salwar kameezs and demure dupattas, Kareena's Avantika adapts to the NY way of dressing in boots, long coats and tan bags. Rani Mukerji flaunts her fashionista avatar in a short skirt and bright top as Saif Ali Khan serenades her in Times Square in Tara Rum Pum. 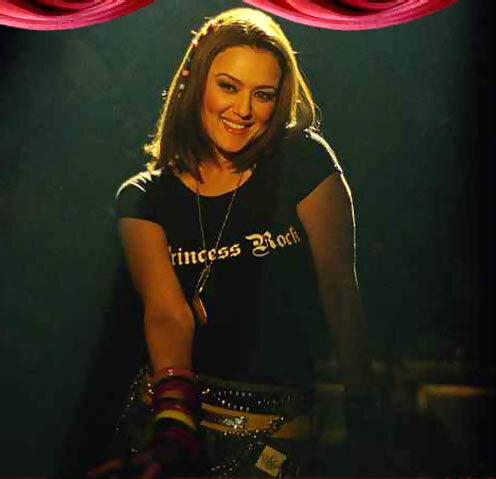 Preity Zinta channels the college rocker chick in an all-black outfit which she teams with a studded belt, chains and bracelets in Shirish Kunder's ill-fated musical Jaan-E-Mann. Up next: Double Trouble on Bollywood's menu! The SEXIEST gangsters of Bollywood? VOTE!